Maximum flexibility and optimum adaptation to your respective aeration requirements means optimum energy usage. 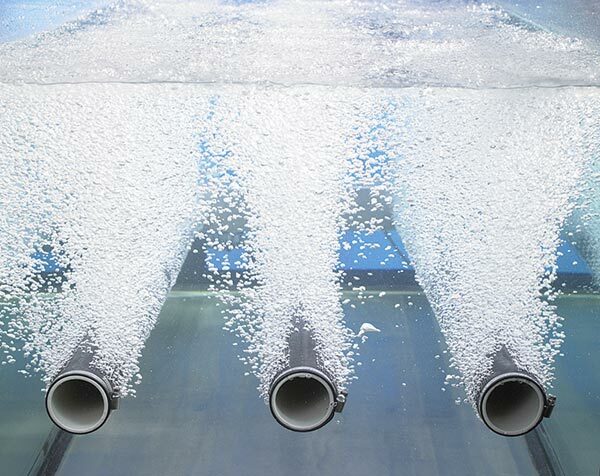 The special arrangement of the air outlet openings ensures fine-bubble aeration with extremely low pressure loss and therefore a highly effective usage of oxygen across the entire aeration area. Modern water and waste water technology requires aeration systems which make a difference ecologically while remaining economically viable, thereby ensuring a maximum amount of process flexibility – with maximum oxygen yield values. This is the basis for efficient biological water purification. 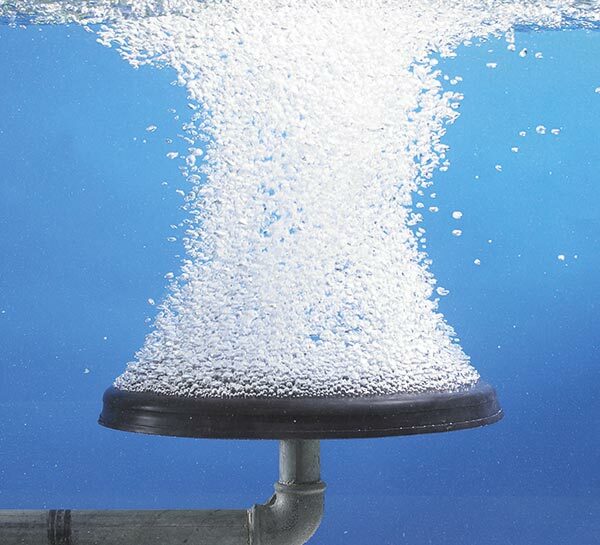 Schüth offers fine-bubble tube and plate membrane aerators that meet these requirements. 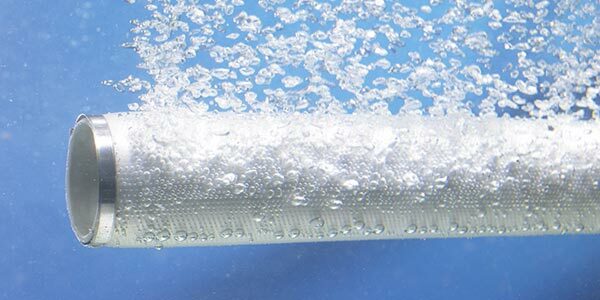 The elasticity of the membrane ensures blockage-free operation, even after the plant is switched off, and therefore makes intermittent operation problem-free, for example, with nitrification or upstream denitrification. We manufacture all aeration membranes according to the individual needs of our customers in various models and dimensions made from specially selected rubber mixtures (EPDM, silicon, NBR) in the broadest possible range of geometric shapes and with a wide variety of perforations. We supply both partial components (e.g. aeration membranes or aeration tubes) as well as complete systems with corresponding supporting frames. An outstanding feature of Schüth aeration membranes is their high resistance to corrosion and ageing, which ensures trouble-free operation and a long service life. Depending on the composition of the clean water, the proven qualities of EPDM are employed, in both the sulphur and peroxide-cured variants. EPDM even has a microbe-resistant quality. 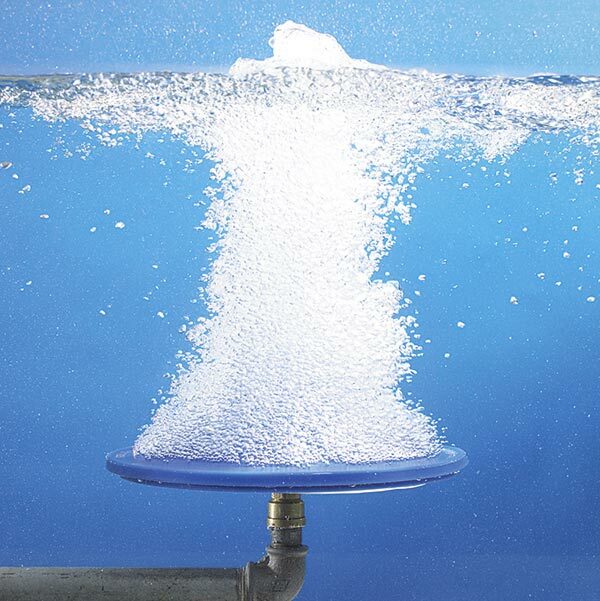 For treating waste water which is heavily contaminated with oils, greases, petrols and aromatics, we offer the proven quality of platinum-cured silicon. In very special cases, a specially developed NBR quality for industrial applications has also proven to be very beneficial. Detailed datasheets are available for all these grades. Would you like to know more about Schüth aeration systems? We would be happy to advise you on your particular aeration application. Tube-pipe aerators are the flexible alternative to conventional ceramic pipe aeration systems when it comes to fine-bubble circulation or surface aeration with all the advantages of an aeration element. They are available in a wide range of tube lengths, diameters and wall thicknesses. The qualities of the tube materials used are backed by well-known rubber manufacturers. The highly developed membrane aerators are ideal for all modern water aeration processes. When used as the only aeration element in extremely polluted water, for example, in waste water treatment plants without preclarification, the flat exhaust gas area prevents the aerator from becoming entangled. They are available in a wide variety of models and diameters. After decades of collaboration and development work with well-known rubber manufacturers, material combinations were discovered that meet these extremely high demands (both chemical and physical).